From beginning to end the process of creating Pralinèle raw food pralines is defined by this central “ingredient”. Every step is checked and checked again for optimum results in terms of love and care, to guarantee the highest possible quality that can be achieved in a manufactory. With growing demand, no one is ever taken on in production unless they are able to meet this requirement for the highest possible standards of quality. This means that only those who want to do the work because they are devoted to it are taken on in production and they are suitably rewarded for it, but no one gets taken on if they only want to work because the money is right. Managing director Danièle Sansour stresses: “ It’s not about producing as much as possible in as short a time as possible. The entire production process is given the space and freedom it requires in order to achieve results of the highest possible quality. This means the production space as well as inner space for all employees, which is provided to enable the valuable product to be created with care and on a sustainable basis. The manufactory is located in part of an old-established wholefood bakery and confectioner’s in Stuttgart and is run as an independent sole trader company managed by Danièle Sansour. The highly valued “outward” side of things is looked after by freelancers. On entering the workshop one is met by an exceptionally fine aroma. The rooms are filled with the aroma of essential oils, floral waters and spices. The raw food pralines feel so perfect – nothing to be added, nothing to be taken away. The taste is unique in character and is a long-lasting delight for the palate. A true treat for the senses created through devotion and care in a production environment run at a slower pace. You feel satiated at every level of being – body, soul and spirit are given essential nourishment. Your overall feeling of well-being couldn’t be raised to a higher plane than this. The recipes were developed by Danièle Sansour from an wide and intuitive sensitivity. The composition of each variety is kept deliberately simple to enable the emphasis in flavour to come across with a specific nuance. The pure sweetness of the dried fruits means there is no need for any sugar additives. Thanks to the fine oils in the various kernels, the full taste sensation is achieved without the addition of milk or cream. The aroma and the fine nuances of flavour are provided by essential oils, floral waters and spices – so there is no need for alcohol. The raw unfermented cocoa bean is a variety of chocolate that is rich in vital substances and full of character. In terms of the selection of raw materials we use nothing but raw food quality from controlled ecological farms and fair trade sources. This means that none of the ingredients are heated to above 42C°, so all the vital substances provided by nature are retained. The ingredients are processed by hand with careful handling. No waste products are created in production. We do not keep any stocks, producing only in small batches to your specific order. Made for you with devotion! The pralines are carefully packed in an elegant praline box with a modern design, along with a tastefully designed information brochure. 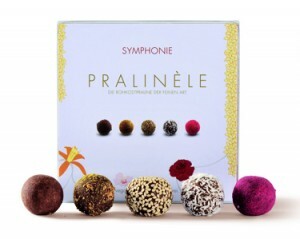 Each package contains nine delicious pralines. Find out for yourself – “Less is more!” A precious gift, the contents of which are value, pleasure and health. 2 Responses to The new raw food pralines! Upon reading above, my mouth is wet already. I can only emagine how it taste what is more when it is real. How many varieties of pralines you have?